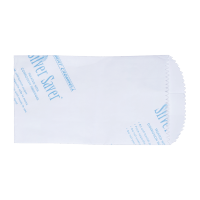 3"x 5" Papírová taška na stříbro Silver Saver paper bags have been chemically treated to remove sulfite vapours. Perfect for shipping or storing silver coins, bars, jewelry or silver-plated items. Helps eliminate corrosion and tarnish for up to 2 years. Protect your investment!